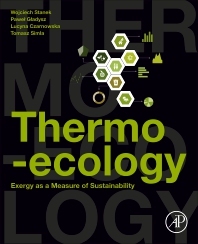 Thermo-ecology: Exergy as a Measure of Sustainability integrates thermo-ecology and exergy replacement cost as a new and original tool called thermo-ecology cost, or TEC. This tool allows for a more inclusive measurement of the impacts of using renewable and non-renewable resources by including the thermodynamics law in decision-making and presenting applications of this tool across industries and lifecycle assessments. It includes ways to investigate these effects more effectively by combining these critical aspects. This combination has emerged as a valuable decision-support tool for policymakers and the industry as they seek to evaluate the impacts of a product or process. Prof. Wojciech Stanek, PhD., DSc is an associate professor at the Institute of Thermal Technology, Faculty of Energy and Environmental Engineering, Silesian University of Technology. He gained his professional experience at the same University where he successively developed his scientific career as a research assistant, assistant professor and associate professor. Currently, he is the head of the Division of Thermodynamics, Energy Management and Refrigeration at the Institute of Thermal Technology. He is one of the world's leading experts in the field of exergy. His main areas of interests are energy systems as well as energy and resources conversion technologies. He has worked on mathematical modelling of energy conversion and management in industrial processes, cumulated energy and exergy consumption, thermo-ecological cost method, thermo-economic issues of environmental protection, life cycle analysis and control systems for power and cogeneration plants using advanced measurement data validation. He has published more than 130 papers in national and international journals and conference proceedings. He has served as a subject editor in Energy – The International Journal since 2010. And he has een a member of the Commission of Energetics of Polish Academy of Sciences since 1999. Dr Gladysz M.Sc. studies in 2010 from the Silesian University of Technology in Power Engineering. His Ph.D. thesis was devoted to the system approach to energy, exergy and environmental analysis of an integrated oxy-fuel combustion power plant with CO2 capture and storage. Currently he is involved in the two Research Projects “Mild Oxy Combustion for Climate and Air” and “Theoretical and computational investigations of new concepts of power plant with Stirling engine fed with cryogenic exergy”. He is the author or co-author of several peer review publications in international journals and conference proceedings. Moreover, he is giving classes at the Silesian University of Technology (Faculty of Energy and Environmental Engineering) focusing around process modelling of energy system, environmental and economic analysis and energy management.